Located on Du Seminaire Street in Griffintown with 750 sq. ft. This 1-bed 1-bath condo features sand blasted cement ceilings, private balcony and abundant fenestration. Luxury building amenities include gym, indoor swimming pool and interior courtyard. This exquisite, fully-furnished corner unit truly captures urban elegance with exposed concrete, stone mosaic focal wall and contemporary décor. With beautiful hardwood floors throughout, the sunny open-concept living space benefits from numerous floor-to-ceiling telescopic windows for maximum natural light and offers a private office corner, den area and 4-person dining table. The fully-equipped linear kitchen features modern finish with European-style fitted cabinetry, recessed appliances and tiled backsplash. The king-size bedroom features a frosted glass wall adjoining the luxurious designer bathroom which is complete with Zen sink and full-size walk-in shower. 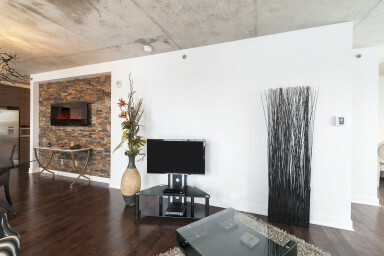 With the best house rentals in Montreal, big city living has never looked this good! 6/8 offering access to plenty of green spaces in an elegant setting. Exceptional building amenities include spacious solarium with indoor swimming pool, gym and a landscaped interior courtyard. Rich in history and heritage, Griffintown was one of the first neighborhoods to develop away from the city center. Once an important industrial center populated by the arrival of a generation of Irish immigrants, Griffintown experienced an economic downturn early in the 20th century but has now become one of Montreal’s most coveted areas. Surrounded by lush green spaces, the Lachine Canal offers a great escape from the hustle and bustle of the city with scenic bike paths, parks and water activities. Nearby Notre Dame Street is host to numerous services, shops, bars and restaurants including the famous Joe Beef and Liverpool House. You will also find easy access to the Expressway, the downtown core and Old Montreal. Find out for yourself why Griffintown is so special!